Pipeline systems are defined by federal regulations as all parts of a pipeline facility through which a hazardous liquid or gas moves, including piping, valves, pumps or compressors, metering and delivery stations, and storage and breakout tanks. Although pipelines are typically located underground, they may also be located aboveground when dictated by operational considerations (such as connections to pump and compressor stations) or environmental conditions (such as geological characteristics) (FEMA, 2015). Natural gas pipelines are the most common type of pipeline in the United States with the second most common being liquid petroleum pipelines that transport crude oil, refined product, and highly volatile liquids (HVLs) to local distribution networks. Pipeline failures are low-probability, potentially high-consequence events. Although gas and liquid pipeline failures are infrequent, the hazardous and inflammable materials released by these events can pose a significant threat to public safety and the built and natural environment. Impacts to life and property can result from inhalation or ingestion of toxins, exposure to a fire or explosion, or exposure to contaminated soils or drinking water (FEMA, 2015). 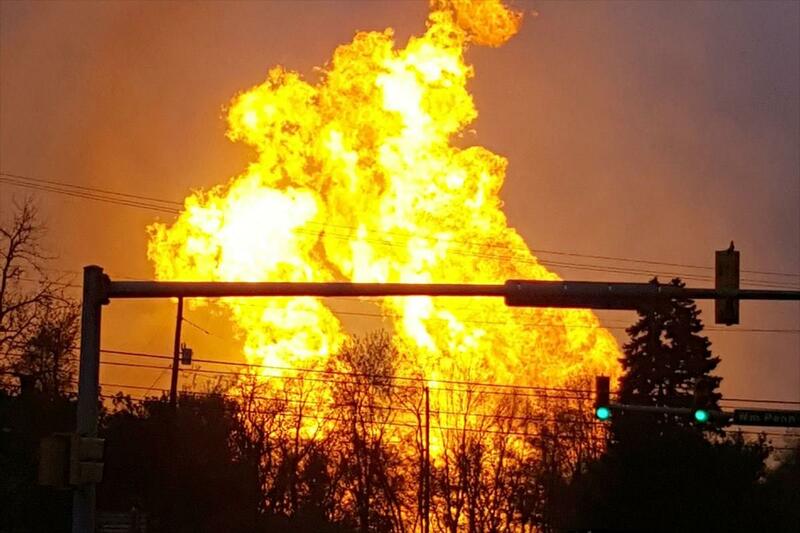 Explosions associated with pipeline failures, for example, can cause severe injury to nearby residents and destroy homes and other property. In 2016 Pennsylvania had 87,931 miles of natural gas pipelines and 3,113 miles of liquid petroleum pipelines. Natural gas pipelines include 803 miles of gas gathering lines, 10,056 miles of gas transmission lines, and 77,072 miles of gas distribution lines, while the liquid petroleum pipelines include 23 miles of crude oil pipeline, 1,942 miles of refined petroleum product pipeline, and 1,148 miles of HVL pipeline (PHMSA, 2018). 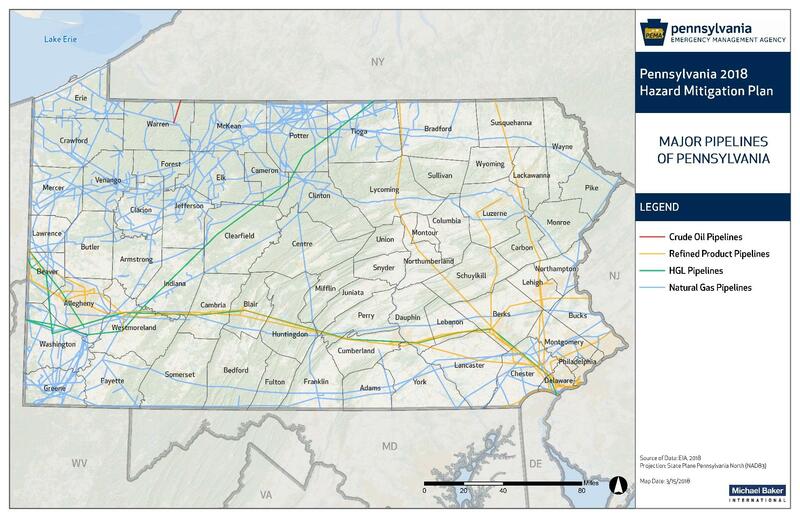 Among Pennsylvania counties, Greene and Washington counties have the highest mileage of natural gas transmission pipelines, and Washington, Chester, and Berks counties have the highest mileage of liquid petroleum pipelines. Significant incidents tend to occur every year, and associated costs vary widely. The five most costly incidents occurred in 1999, 2000, 2005, 2011, and 2016. The reported causes of these incidents included corrosion, material or welding failure, and temperature extremes (such as when cold weather causes frost heaves or frozen instrumentation lines). From June 2014 to March 2018, PEMA-KC captured 21 major pipeline incidents in 14 counties. Many of these incidents occurred in the southwestern part of the state. The future probability of high-impact pipeline failures will be shaped by the maintenance of existing pipeline systems, the construction of new pipeline systems, and the amount of new development that occurs near pipelines. 75 percent of Pennsylvania’s liquid petroleum pipelines were installed before 1970, and 56 percent before 1960. As the metal in these aging pipelines reacts with the environment, it can become corroded, causing a loss of pipe strength that can lead to leakage or rupture. Corrosion is one of the most prevalent causes of pipeline incidents and was listed as the cause for 20 percent of significant pipeline incidents nationwide between 1998 and 2017, and 15 percent of pipeline incidents in Pennsylvania. Maintenance and repair, however, can reduce the risk of corrosion. Major Pipelines of Pennsylvania (EIA, 2018). Township, Pennsylvania. Source: NPR State Impact. 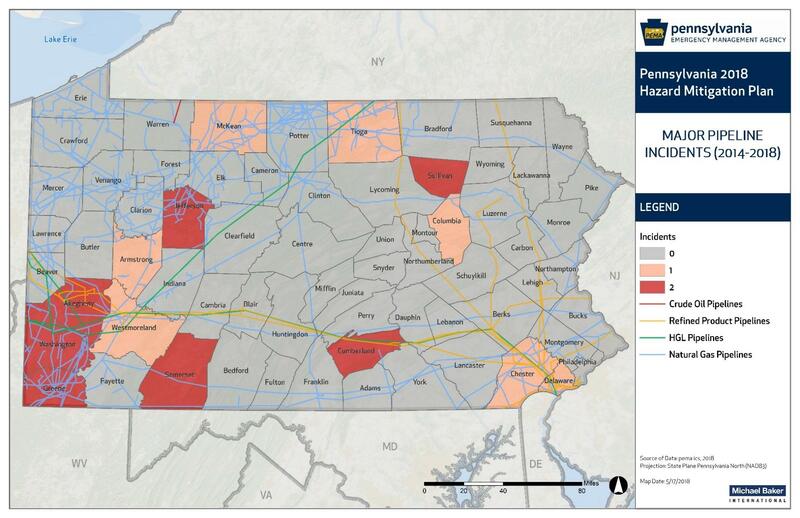 Major pipeline incidents in Pennsylvania (PEMA, 2018).